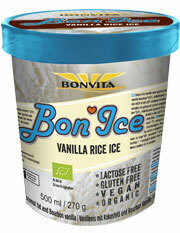 Did you know that we also have organic ice cream in the Bonvita Range? No less than 6 types of ice cream! All the ice cream is vegan, lactose-free and gluten-free. This means that also people with a gluten or lactose intolerance can enjoy the tasty Bonvita ice cream without any worries. The basis for this particular ice cream is not milk but "rice milk", the big advantage of rice milk is that the ice crystals are very small, much smaller than when freezing milk. 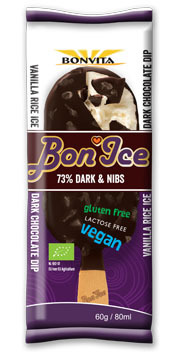 This makes the Bonvita ice cream very soft and creamy. We often get the reaction that this ice cream is tastier than regular ice cream. Unfortunately, the ice cream is not sold in our webshop, because we can't send frozen products. 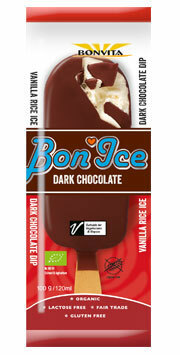 Bonvita ice cream is available in the Dutch reform and healthfood shops such as Ekoplaza and Odin. Online at: www.thefreefromshop.nl. In Beglium, among others, at BioPlanet. For sales points see also Biofresh.be. Companies can order from Udea. 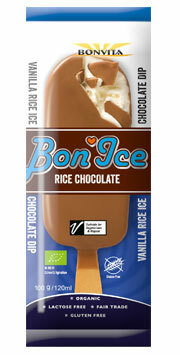 · Bonvita Rice Chocolate Magnum, click here for the product specifications. · Bonvita Dark Chocolate Magnum, click here for the product specifications. · Bonvita Dark Nibs Magnum, click here for the product specifications. 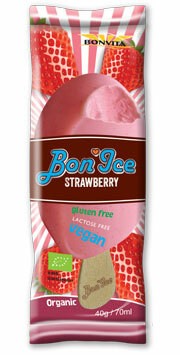 · Bonvita Strawberry Rice Ice, click here for the product specifications. 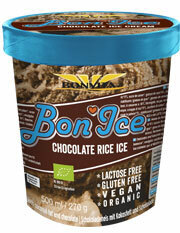 · Bonvita Chocolate Ice Cream, click here for the product specifications. · Bonvita Vanilla Rice Ice Cup, click here for the productspecifications.